Fortunately, birds that flushed didn’t travel far. We watched where most headed, picked up our kills and took a brief break. Minutes later, reloaded and recomposed from the initial adrenaline rush, we found them again and began another stalk. Repeating this procedure during the next two hours, Steven fired more than a box of shells before bagging his 15-bird limit. Sound impossible? Guess again! Louisiana sportsmen can target abundant game birds with long seasons that frequently go unnoticed by others. Some hunters occasionally shoot gallinules spotted near a duck blind, but these largely ignored birds can provide incredible action with liberal bag limits and little competition. A common gallinule walks along a shoreline. Both common and purple species thrive in freshwater marshes, lake shorelines, river backwaters and other wetlands. They like abundant thick vegetation growing in or near the water edge. Some occasionally venture into brackish marshes, but most birds prefer sweeter water. The Louisiana rail and gallinule season generally runs concurrent with the September teal season and November to January duck season. Louisiana sportsmen may bag up to 15 gallinules, 15 king and clapper rails and 25 sora or Virginia rails per day. A drake purple gallinule tiptoes easily across lily pads in a wetland. Since gallinules do not respond to decoys or calls, sportsmen must go to them. Some people hunt teal or ducks at first light and then go looking for gallinules later in the morning. Some sportsmen walk the marshes flushing birds, but soft mud makes slogging through many southeast Louisiana wetlands impossible for any distance. Therefore, most people hunt gallinules from small boats. Federal law prohibits people from shooting at migratory birds, including rails and gallinules, from boats under motor or sail power, but people can paddle, drift or pole through the marshes where legal and hunt them that way. Look for gallinules in sloughs and small channels with abundant matted aquatic vegetation and tall reeds that provide significant shoreline cover. They frequently walk along reedy shorelines. 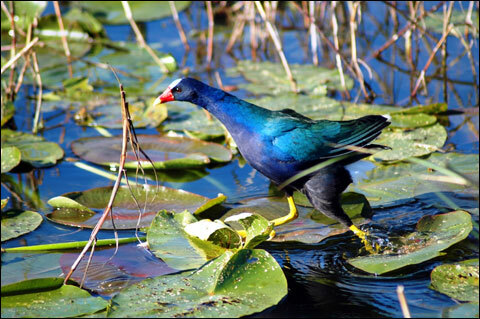 With their long lobed rather than webbed toes, gallinules nimbly step over floating lily pads, water hyacinths or other matted vegetation. Sometimes, they gather in huge flocks on floating aquatic vegetation. At low tide, scan exposed mudbanks and grassy edges for movement. At high tide, scrutinize any tall canes. Birds frequently freeze to avoid enemies, even if the boat passes within a few feet of them. 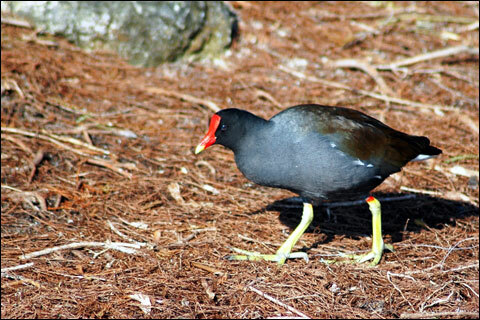 Gallinules can fly and swim, but prefer to dash into thick weeds to escape their enemies. After birds dart into thick cover, paddle about 30 yards away and wait quietly. Sometimes, they come back to the shorelines a few minutes later. If they don’t reappear, remember that spot and return to it later. When hunting from a small boat, dip paddles into the water as silently as possible. Listen for the distinctive cackling or sound of feet pattering over the surface. Hug shorelines or keep islands, tall canes and other available cover between the boat and the birds whenever possible. Take the inside curve on any bends. When rounding bends or emerging from behind tiny islands, sportsmen may surprise birds only a few yards away. 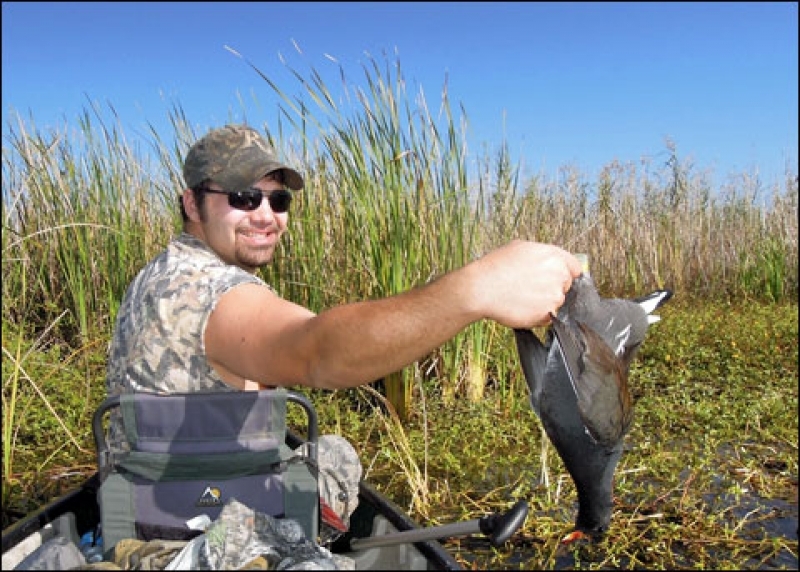 Daniel Felsher takes a shot at a gallinule while hunting a marsh from a canoe. When hunting alone, paddlers can put their shotguns in safe, convenient places, but hunting in teams makes a more effective technique. When hunting in pairs, only keep one gun loaded at a time for safety reasons. Position the shooter in the bow ready for action and the rear person serving as primary paddler and spotter. Young shooters frequently grow bored sitting still and quiet in blinds for long hours without seeing game. However, when double-teaming gallinules in a canoe or pirogue, a young sportsmen can sit in relative comfort and usually expect action. On a good day, gallinule jumpers might see hundreds of birds and fire multiple times. In addition, boaters can carry food and refreshments to take occasional breaks. Gallinules seldom experience much pressure, so boaters can often paddle or pole fairly close to birds in thick cover. Even after pellets splatter around them, some birds may remain in place. Frequently, shooters bag two or three birds before others become nervous, scatter or disappear into lush thickets. Even after gun reports fade to echoes, unnoticed birds may still hide in the grass or burst from cover. Daniel Felsher admires a common gallinule that he downed. To become airborne, gallinules must run across the water like coots, making excellent wing-shooting targets for young hunters. When they do take flight, these chicken-like fowl seldom fly more than a few yards before quickly dropping into a clump of dense canes to hide. Hunters can usually relocate them rather quickly. After busting a flock, wait a few minutes for the birds to settle down and then proceed in the direction where the majority headed. Don’t go after every bird in one flock. Shoot a few and then move to another area to let the flock rest a while. If possible, don’t hunt the same location too often. Fortunately, sportsmen seldom travel very far to find more birds in good habitat. Louisiana contains more than 40 percent of the coastal wetlands in the United States and 25 percent of the total wetlands in the country. Several rivers flow through the Sportsman’s Paradise, forming deltas that create ideal gallinule habitat. Many state wildlife management areas conserve outstanding habitat for these birds. About six miles east of Slidell, Louisiana, Pearl River WMA covers 35,728 acres. Pearl River flows out of central Mississippi and meanders 490 miles to the marshes north of Lake Borgne, creating 119 miles of the Louisiana-Mississippi boundary. The river splits near Talisheek, La., with West Pearl carrying the major flow through Louisiana and East Pearl continuing down the state line. The Pearl River WMA largely exists between West Pearl and East Pearl Rivers. The rivers further subdivide into several other streams with numerous tributaries. The land gradually changes from upland forest to bottomlands, to cypress swamps. Below U.S. 90, the management area contains about 10,000 acres of fresh to brackish marshes, which can provide excellent gallinule habitat. Sportsmen can access West Pearl from Slidell or launch into East Pearl at U.S. 90. Big Branch Marsh National Wildlife Refuge covers about 19,000 acres of fresh to brackish marshes, mixed hardwoods and pine savannahs along the northern shoreline of Lake Pontchartrain. The largest section exists west of Slidell near Lacombe. Another tract sits in the Fritchie Marsh east of Slidell. During teal and duck seasons, the refuge allows gallinule hunting until noon on Wednesdays, Thursdays, Saturdays and Sundays by permit. For information about hunting the refuge, see www.fws.gov/bigbranchmarsh . About 10 miles south of Venice, Louisiana, Pass-A-Loutre WMA spreads through 115,596 acres of delta marshes and bayous. Reachable only by boat, these fertile marshes don’t offer much solid ground, but can hold an enormous amount of birdlife. Many migratory birds stop in the last place to feed before leaving North America for points farther south. Approximately 15 miles southeast of Houma, Louisiana, Pointe-Aux-Chenes WMA offers sportsmen 33,480 acres of Terrebonne and Lafourche parishes to roam. Habitat ranges from intermediate to brackish marshes pockmarked by numerous ponds, bayous and canals. Low rises along canal banks often grow up in thick vegetation, providing good gallinule habitat. People can only access this tidal system by boat. Other Louisiana wildlife management areas that hold gallinules include the 8,328-acre Manchac near Ponchatoula on the western shoreline of Lake Pontchartrain, the 137,695-acre Atchafalaya Delta near Morgan City and the 34,520-acres at Salvador/Timken complex near Westwego. For Louisiana license and hunting season information, see www.wlf.louisiana.gov . 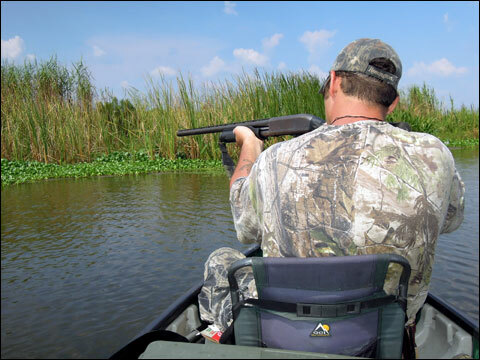 For more information about hunting on Louisiana wildlife management areas, see www.wlf.louisiana.gov/wma and click on the specific property.